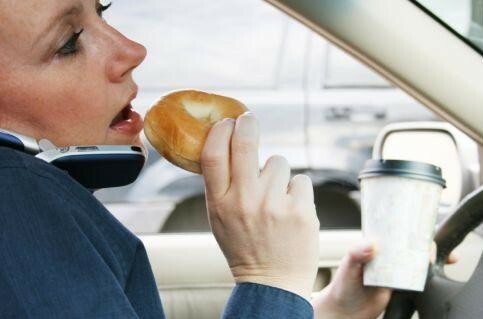 What is the number one distraction behind the wheel – using a cell phone! Unfortunately, you are four times more likely to crash if talking on a cell phone. Hands-free is often considered a safe alternative, but studies show hands-free devices provide no safety benefit because it’s the conversation , not the device that creates the danger. Cell phone use while driving isn’t just a visual and manual distraction, but a cognitive distraction. In addition to taking their eyes and hands off the wheel, cell phone talkers take their mind off the primary task of driving. They display slower reaction times and tend to have difficulty staying in their lane. They are also less likely to notice exits, red lights and stop signs, as well as other relevant objects and visual cues. Cell phone conversation is just one type of distracted driving. Texting while driving is extremely dangerous and illegal in Virginia and Maryland- it increases your chances of a crash by up to 23 times. Other common distracting behaviors behind the wheel include tending to pets and children, reaching for a moving object, smoking, personal grooming, reading, eating and drinking, looking at an external object and drowsy driving. CHANGE YOUR WAYS and recognize the activities that distract you such as eating, conversing on the phone, or changing a CD. MAKE A PLAN. Get directions, study your route, and check weather and road conditions. MANAGE YOUR TIME so that you do not have to multitask or drive aggressively on the road. DON’T LET YOUR DRIVE TIME BECOME YOUR DOWN TIME. SCAN the roadway to make sure that you are aware of others on the road at all times. Be prepared for the unpredictability of others. CONCENTRATE on your driving. Make sure that you are not upset or tired when getting on the road. PULL OVER to a safe place if you need to do something that will take your eyes and/or mind off of the road. REDUCE THE USE! Use GPS and other technology sensibly. Program devices before you hit the gas. TAKE A REFRESHER CLASS! A driver improvement class can raise your awareness and help you assess your driving behaviors and might save you money on your car insurance. BUCKLE UP, EVERY TRIP, EVERY TIME. Making sure that everyone is properly buckled up is the best defense against distracted drivers. This entry was posted in Security, Uncategorized. Bookmark the permalink. ← Chesapeake Bay Foundation Canoe and Boat Trips!